These images of Marina and the Diamonds and (Marina Lambrini Diamandis) CocknBullKid (Anita Blay) were taken on Tuesday night at the Forum in London. The lighting was not as bad as the Forum has come to be known for so managed to shoot these with an ISO or around 2000. Click on either image to see a slideshow of each acts performance. Marina, is a Welsh singer-songwriter of Greek descent. 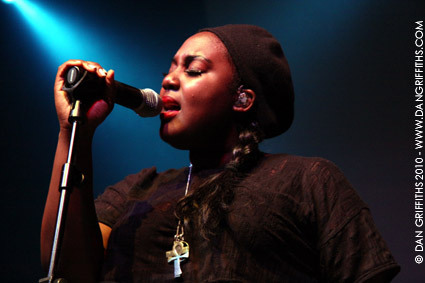 She rose to fame after reaching number two on the BBC Sound of 2010 poll list, coming second to Ellie Goulding. After releasing one private EP, Diamandis released her second extended play, The Crown Jewels EP, with help from Neon Gold Records, in 2009. Now signed to 679 Recordings, she released her debut full-length studio album, The Family Jewels, followed by her third extended play, The American Jewels EP, in 2010. CocknBullKid got a slot on Jools Holland even before she signed to Island Records. The 25 year old Hackney resident, has been working towards the release of her debut album Adulthood. The album was recorded in London, Paris and Stockholm with production from Liam Howe (man behind Marina and the Diamonds and member of ’90s band Sneaker Pimps) and was put together in Howe’s Dalston home studio, surrounded by vintage synths, and in the cosy confines of Snap Studios in North London. Blay co-wrote the songs with a variety of talents, including electronic, eccentric piano man Gonzales who worked on half the songs. There are a couple of songs from Peter Morén from Peter, Björn and John and a co-write each from Joe Flory aka Primary, Joseph ‘Metronomy’ Mount who produced Blay’s Moshi Moshi-released early songs, and long-time collaborator Mark Tieku.